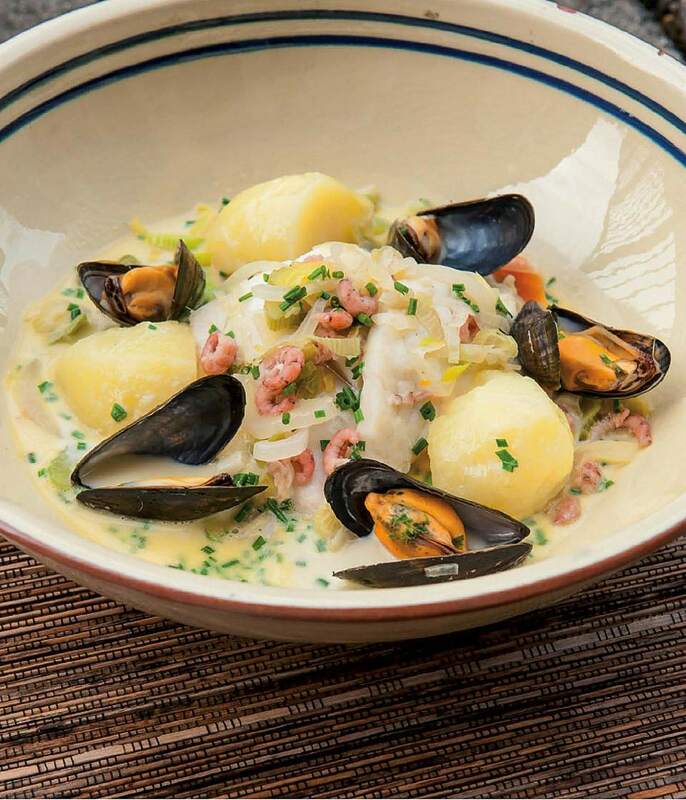 This traditional Flemish fish dish from Ghent straddles that notional territory between a soup and a stew. Some modern versions use both chicken and fish, but this Waterzooi recipe follows a deliciously old-fashioned all-fish formula. Serve with fresh, crusty bread to mop up the deeply flavored broth. The recipe is from a Dutch cookbook called Werken met Vis (or 'Working with Fish'), and has been translated and adapted for this site and published here with the permission of the publisher. Add the celery, carrot and onion and cook the vegetables for 3-5 minutes, or until they are soft and glazed. Now add the leeks and cook for a further 2 minutes. Gently poach the fish fillets in the broth for 3-5 minutes. Add the mussels after 1 minute. Remove the seafood from the pan once the mussels have opened and set aside. Strain the stock into a saucepan. Set the vegetables aside to use later. Put the stock back on the heat and, once it reaches boiling point, add the cream and egg mixture to thicken the stock and create a sauce. Now mix well with a whisk and make sure the sauce does not come to the boil again. Add the peeled shrimp and half the chives and stir. Place the fish pieces in a serving bowl along with the vegetables and potatoes. Pour the sauce over it. Most mussels sold in the Netherlands today have already been cleaned and debearded. If your mussels haven't been cleaned, simply use a knife or wire brush to scrape off any barnacles on the shells. Debeard the mussels by pulling off any strands. Place the mussels in a colander and rinse thoroughly under cool water. Discard any that have broken shells. Tap the open mussels on a hard surface and if they do not close within a few moments, throw them out too. Werken met Vis by Dutch sustainable seafood champion Bart van Olphen offers guidance in choosing, cleaning, preparing and cooking a wide range of sustainable (European) seafood varieties with traditional recipes from the Netherlands, Belgium, and beyond.